There is a graphic and enjoyable description of his school life with his friends Shlok, Nirbhai, Abhimanu, Navjot, Ankit, Mohit, Nitin, Zorawar and Sagar. They tease each other and make friends with girls in their class, Pankhudi, Aanchal, Kriti and Swati. Shiva has very interestingly written about the day-to-day school life. How they tease each other sitting in the class and how much attention they give to studies and to the girls. Their naughtiness takes us back to our own schooldays and brings a smile to our lips. It is not only about their naughtiness that he writes but also about their insecurities. As a teenager, he is unable to decide about his future. Even talking to his parents does not satisfy him. He is in a dilemma, sometimes he wants to become a doctor like his parents or become an engineer, or an architect or take English and become a writer. All this causes confusion and he starts losing confidence. Then one day, Krish, a boy older to Bharat and the son of a family friend talks to him and asks about the reason of his being upset and losing confidence. Bharat shares how everyone tells him that Class 11th and 12th are the platform of one's life's career and if one loses one’s mind in these crucial years, one ends up losing everything in life. "This is pressurising me, I am really unable to decide which subjects to take." Krish explains to him about choice of subjects and adjustments. Sharing his innermost feelings makes Bharat feel relaxed and lighter. 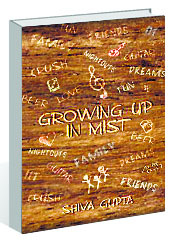 In the last chapter, Shiva says why he kept the title of this book Growing up in Mist. He feels while growing up we are not always clear of what we would do exactly. It takes time and guidance to realise what we actually want to be. He advises youngsters: "Write down your dreams and everything you want and work accordingly. Find your directions and work. Your parents may have different ideas for you but stop living life with a conventional approach. Just follow your dreams. Do what you think is best for you." For grown-ups who are reading this part and contradict his opinion because they believe that they have seen life more than the children, he says: "You definitely have but only yours. Parents have seen more life and can guide their child in a better way so as to fulfil his dreams by explaining him plus and minus points." This book is an interesting insight into the lives of highschool teenagers and their different world of friendship. love and infatuations and help in finding directions for their goals.